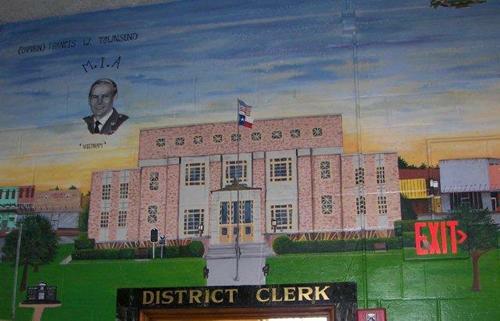 Cherokee County Courthouse Murals, Rusk Texas. The 1941 Art-Moderne style Cherokee County courthouse in Rusk is not your run of the mill W.P.A. project. The attractive stone veneer sets it apart from some other modern courthouses of the time period, but it is the inside of the courthouse that really deserves more attention. It is becoming apparent to me that some of the finest artists in Texas are residents of our state's jails. 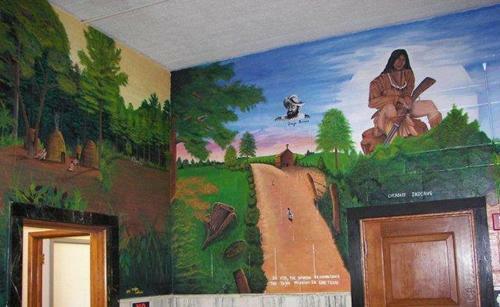 About five or six years ago, a Cherokee County inmate was enlisted to create a mural of the history of Cherokee County on the upper floor of the courthouse. 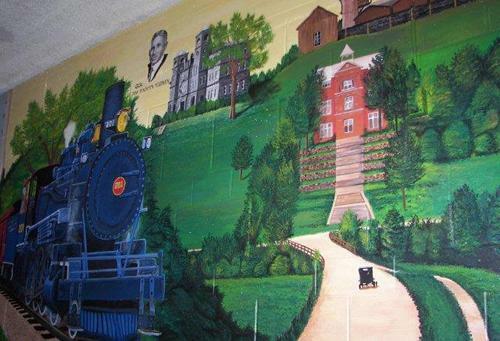 The mural extends from the east to the west side of the building and is, mostly, in chronological order. 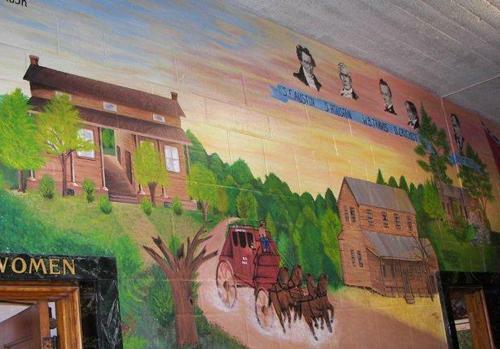 The ground floor also contains portraits of famous Texans, famous Cherokee County residents and local heroes. The walls of the first floor are also lined with vintage photographs of the county and, just like in the Anderson County courthouse in Palestine, District Court Judge Bascom Bentley has a plethora of his political and sports memorabilia displayed. So, if you have the time, take a moment to explore, either here or at the courthouse and get to know the history of the people and places of Cherokee County. Photo 1: Depiction of the early inhabitants of Cherokee County, the Caddo and Cherokee Indians, along with the Spanish missionaries. Photo 2: The current monument dedicated to the Killough Massacre of 1838. To the left, Mrs. Killough and her baby son are being saved by a friendly Indian. 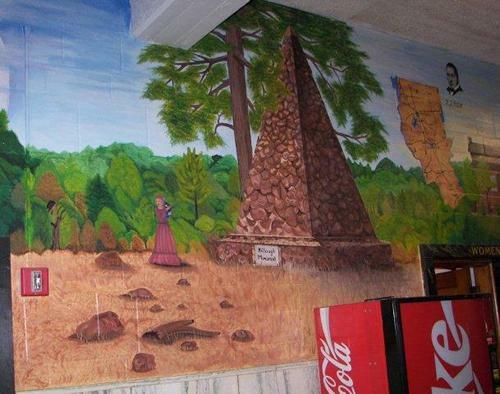 To the right is an outline of Cherokee County and a portrait of General Thomas Jefferson Rusk, the namesake of the county seat. Photo 3: On the left is the Forest Hill Plantation which is in south central Cherokee County near Alto. The heroes of the Texas Revolution are seen perched over the Hatchett Ferry Inn that was built before 1850 on the Angelina River at the Nacogdoches and Cherokee County boundary. (It was torn down over 25 years ago.) On the extreme right is a portrait of Jim Hogg, who was born near Rusk and was the first native Texan to become the state's governor. The house he was born in is also depicted. Photo 4: Honoring the over 2,000 men from Cherokee County who served in the Civil War. The Confederate Memorial on the courthouse grounds is seen in the center of this picture. Photo 5: Antique steam engines still roll into Rusk as part of the Texas State Railroad. The gray building is the Lon Morris College in Jacksonville. The portrait is of John Benjamin Kendrick. Born near Jacksonville, Kendrick went to Wyoming on a cattle drive, settled there and became the Wyoming state governor in 1914 and later a U.S. Senator. I think the red building on the right is the old Rusk Penitentiary building and the buildings behind it are the manufacturing plants where prisoners worked, building things like the dome for the State Capitol. Photo 6: On the left is the 546 foot bridge in Footbridge Garden Park in Rusk. Built in 1861 to cross a flood prone valley, it is thought to be the nation's longest footbridge. In the middle is the Tomato Queen of Jacksonville in a field of tomato vines. On top right is the Tomato Bowl Stadium in Jacksonville. 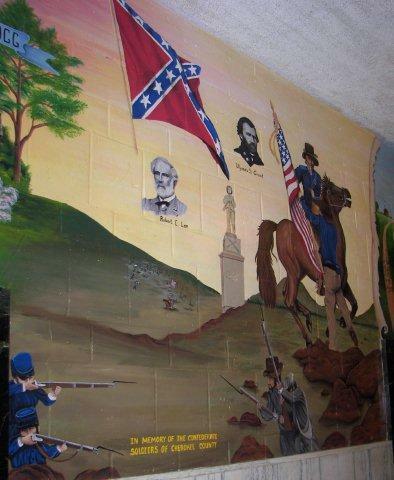 Underneath that is the Jacksonville Baptist College and a depiction of Cherokee County soldiers in World War I. 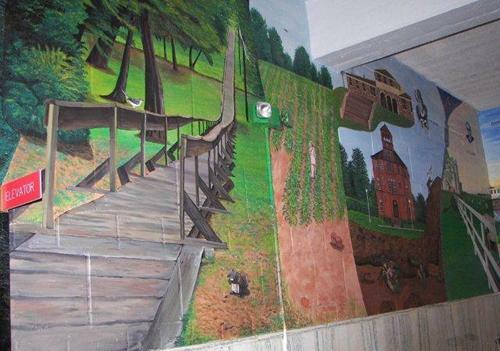 Photo 7: The final section of the mural shows the current county courthouse in front of several historic buildings on the square in Rusk. In the top left corner is a portrait honoring Captain Francis W. Townsend, a Cherokee County resident who was declared missing in action in the Vietnam War.